The Government of Punjab has declared hue amount for providing subsidy on potash fertilizers for the current growing season. 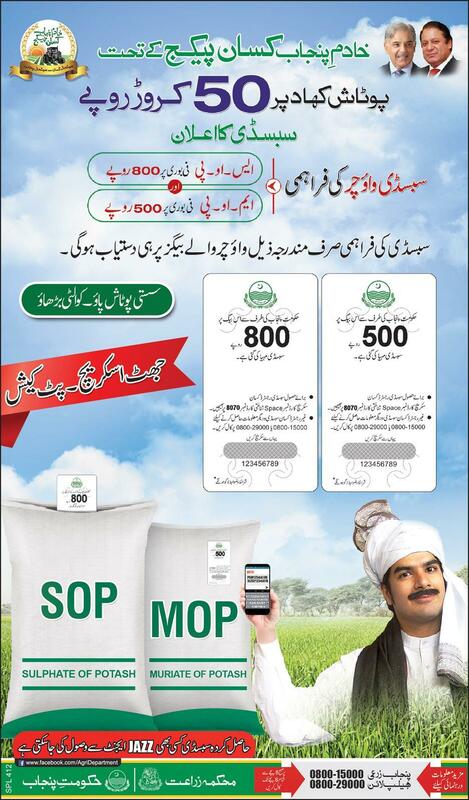 The subsidy will be provided on both SoP (Sulphate of Potash) and MoP (Murate of Potash) fertilizers bags. Each bag of Suplate of potash has subsidy of Rs. 800 and for Murate of Potash, the subsidy is Rs. 500 per bag. The total amount of subsidy allocated for this program is 500 million. The amount of subsidy will be disbursed through Jazz Cash. The purchaser of fertilizer bag will have to scratch the hidden code and will send that number to 8070. The format of message should be “Code” “CNIC Number”. Farmers interested in this voucher subsidy program may get further information from toll free helplines at 0800-29000 and 0800-15000.